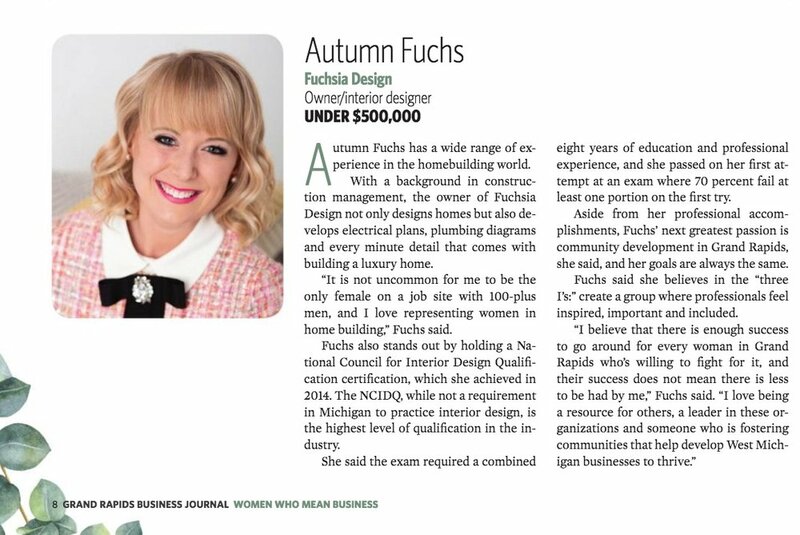 On March 19th, The Grand Rapids Business Journal hosted the Women Who Mean Business event where I was honored with the Top Woman Owned Business Award for the .5m revenue category. This post today is twofold. Above is a video of my acceptance speech where I shared my advice for women in leadership, and it might not be what you would think. (*Note: While I’m extremely grateful to my husband for filming this from all the way back at table #16, the audio is a little easier to follow if you turn the CC subtitles on). I’m also sharing an inside look into all that went into applying for the recognition and how they decided on Fuchsia Design as the winner! Back in November, I received an email that I had been nominated for this award, and I was then asked to submit an application to the Grand Rapids Business Journal. This application included a lengthy questionnaire about my community involvements, leadership roles, mentoring, professional achievements, academic history, and a number of other things. I also had to submit a current resume and the craziest part - my last three end-of-year tax returns to an attorney at Beane Garter. Once the attorney had reviewed all of the applicants’ revenue history and the GRBJ reviewed the resumes and questionnaire responses, they narrowed it down to a list of finalists. On December 27th I was notified that I was a finalist, and they had selected 12 additional businesses for my revenue category. Wow! I was so honored, and I couldn’t wait to find out the other businesses being recognized. In the meantime, a panel of judges reviewed the finalists and selected a winner to be revealed at the Women Who Mean Business event. A week before the event, I received an email that the winner would be asked to give a 5 minute speech. I literally considered not writing a speech. It wasn’t that I didn’t have faith in my business, I just knew that I would be standing alongside other inspiring female entrepreneurs. For example, Ashley Ward owns Hire for Hope and donates 10% of her profits to Safe Haven Ministries after escaping an abusive relationship. Kristen Revere and Alyssa Veneklase own Gold Coast Doulas and collected 18,963 diapers for Nestlings Diaper Bank last year. Elise Kutt owns Mod Bettie Portraits and focuses on empowering women through photography focused on body positivity. Kristine Kletke owns PMSI Marketing and Social Media, and not only was she nominated – she was nominated FOUR times by prior clients! Dr. Sandy Dettmann overcame homelessness and addiction to open up The Dettmann Center - a 24-hour access addiction medical center. The list goes on and on! Beyond honored to be recognized, it genuinely never occurred to me that I might win this award. On the day of the event, they individually called each honoree and had us stand to be recognized. 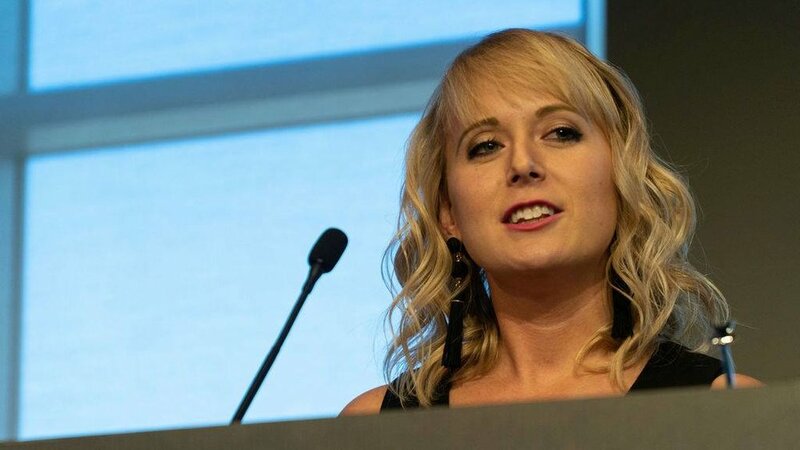 I had just finished telling my table mate – Dr. Sandy Dettmann – how inspired I was by her story and I was hoping she would receive the award, when they said, “And the winner is – Autumn Fuchs”. Somewhere, buried in my purse, was a folded up piece of paper with a speech. A speech that I’m very grateful to have prepared, but admittedly hadn’t re-read since the day I typed it. I can genuinely say I’ve never been more shocked in my entire life (so much so, that I was having a hard time even forming words during the first 60 seconds of standing at the podium). I made my way to the stage and stood in front of nearly 500 of Grand Rapids’ most inspiring female leaders to share my semblance of wisdom. During my speech (shown in the video above), I decided to focus on the things I’ve been told I can’t or shouldn’t do throughout my adult years and how that has translated into the advice I have for women in leadership. There’s a lot to be said about someone who pursues their dreams despite what others say and beats the odds in a creative industry. My journey has not been easy, and my success has not come without a lot of determination and roadblocks along the way, but I’m grateful to have never been handed anything because it made me into a hard worker. I recently read a quote that said, “remember the time you wanted what you have now.” This career is what I’ve always aspired to have. Being awarded this recognition meant achieving a goal I didn’t even know I had as it surely seemed too high to aim for at the age of 30. Often, I’m overwhelmed by how far I’ve come in a short period of time because as someone who’s always looking to achieve more, the ledges I’m jumping off of keeping getting higher. Where to go from here only time will tell, but I’m grateful to all of you for your support in Fuchsia Design, and I’m excited to see what’s next!